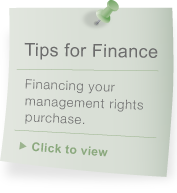 Borrowing for management rights. How much can I borrow? Unit and Management Rights Combined Value x 65% to 75% gearing. Before your application is presented to a prospective lender we will go through a thorough assessment with you. Our service ensures that your application is presented in the best possible light. Intending new entrants to the industry should not be deterred by not having had a management rights previously. In most situations “life experience” and an ability to communicate effectively are the most important qualifications.